If the result is not as specified, replace the windshield wiper switch assembly. (b) Check the intermittent operation. (1) Connect a voltmeter positive (+) lead to terminal D40-3 (+1) and a negative (-) lead to terminal D39-2 (EW). (2) Connect a battery positive (+) lead to terminal D40-2 (+B) and a negative (-) lead to terminal D39-2 (EW) and D40-1 (+S). (3) Turn the wiper switch to the INT position. (4) Connect a battery positive (+) lead to terminal D40-1 (+S) for 5 seconds. (5) Connect a battery negative (-) lead to terminal D40-1 (+S). 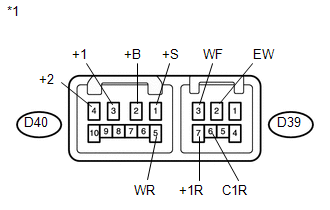 Operate the intermittent wiper relay and check the voltage between terminals D40-3 (+1) and D39-2 (EW). Voltage changes as shown in the illustration.